"Mark and Lisa Bastiaansen, egg farmers in Arkona, Ontario, enjoy this layered egg casserole at Christmas and other times during the year." Trim crusts from bread; reserve crusts. Cover bottom of greased 13 x 9-inch (33 x 23 cm) baking dish with slices of bread, trimming to fit if necessary. Cover with ham, then cheese. Top with another layer of bread. Whisk eggs. Add onion, green pepper, dry mustard, pepper, Worcestershire sauce and Tabasco; whisk to combine. Whisk in milk. Pour mixture over bread. Cover and refrigerate overnight. The next day, stir butter into bread crumbs until moistened. 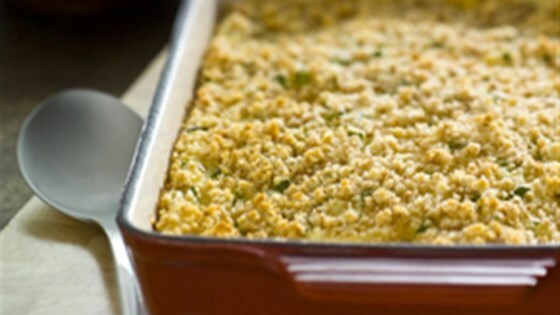 Sprinkle buttered crumbs over top of casserole. Bake in a preheated 350 degrees F (180 degrees F) oven until puffed, set and golden brown, about 1 to 1-1/4 hours. Make this special casserole for a Christmas morning treat. ... that should be 1/2 tsp. of dry mustard not 1/2 cup. With half a cup of dry mustard it could change the cook into a 'lifer' after all of the guests have died. I used cornflakes or special K on the top instead of the breadcrumbs.